Other people have analyzed different U.S. charts that they follow, so I would like to give you my take on what is going on by the chart I watch. It is the one for the signing of the Articles of Confederation; suggested by deceased astrologer David Solte. The signing happened on November 15, 1777, 12:46 PM, York Pennsylvania. I have relocated the chart for Washington D.C. which doesn't change it any. I then generated a triple chart. The relocated natal is on the inside, the progressed for today, the deadline for our debt dilemma in the middle wheel, and the transits for Washington today at 9AM are in the outer wheel. This chart is full of really stressful aspects, which describes this situation to a T. Congress has been fighting over this for months now, which is reflected in the chart by the T-square of progressed Mars at 05 Cancer 16 in the 5th house opposing transiting retrograde Pluto at 5 Capricorn 29 in the 11th house of Congress and transiting retrograde Uranus at 04 Aries 21 in the 1st house. Things really got ugly between opposing forces, as the Mars-Pluto attests to. Add nervous Uranus to the mix, and after the Senate passed the debt-ceiling deal, the President didn't sign it into law until just hours before a potential default on the nation?s debt obligations would have taken place. The Mars in Cancer, in the sign of homes opposing Pluto (banks) in fearful Capricorn tells us that the banks are not lending out money like they should be, and the fore closer situation is still serious. Progressed Venus at 12 Leo 43 in the 6th house of the work force is inconjunct natal Mars at 12 Capricorn 23, also in the 11th house of hopes and wishes. This explains why businesses are not expanding now. Everything seems to be at a stand still, or maybe, even getting worse! Transiting Jupiter at 9 Taurus 06 in the 2nd house of money formed another T-square with the transiting Sun today at 09 Leo 55 in the 6th house of the military and natal Mercury at 09 Scorpio 43 (secretive) in the 8th house (secretive). The White House said in a fact sheet today that the new debt deal would cut $350 billion from defense spending over the next ten years, but there are no specifics in the bill on defense cuts, and no way to tell what the final cuts will be. Furthermore, they said that " these reductions will be implemented based on the outcome of a review of our missions, roles, and capabilities that will reflect the President's commitment to protecting our national security." But if you look at the text of the bill, there is simply no language on how much the defense budget will actually be cut. What the bill does is set spending caps for "security" spending, which the administration defines as defense, homeland security, intelligence, nuclear weapons, diplomacy, and foreign aid. There's no breakdown that defines which of these agencies get what, so there's no way to be sure that all the cuts would come from "defense." It is all very mysterious 8th house like! Natal U.S. Neptune at 28 Virgo 43 in the 7th house of other nations forms yet another T-square to the progressed nodes at 28 degrees and 48 minutes of Gemini and Sagittarius respectively. A Russian spokesman commented that ?cuts in social spending and higher taxes are still the only way of reducing budget expenditures and a country?s sovereign debt.? Other countries south of our border remarked that we have not learned a lesson from other countries that have had the same problem, and that we woke up too late to our serious spending problems. And Yao Yang, director of the China Center for Economic Research at Peking University said that the US deficit problem ?is ultimately the result of the conundrum of a welfare state following the capitalist system. Both are uncompromising ideals cherished by a substantial percentage of the population. The fight will resurface in the future even if the present deadlock is broken, and that there is a lesson for other countries here. The best a country can do is to fence off the contagious effects of such fights and rely more on the domestic economy for further growth.? However, in other countries, there are problems for them as they deal with fiat currencies such as the Euro and the European debt crisis. There was yet another T-square working today. It was the progressed part of fortune in the 1st house at 29 Pisces 53 squaring transiting Mars at 29 Gemini 26 which conjoins the 5th house cusp at 29 Gemini 33. And of course this goes on to include the 11th house cusp at 29 Sagittarius 33. This aspect ties into U.S. stocks falling hard today, posting their longest losing streak since the heart of the 2008 credit crisis, on investor worries about upcoming federal deficit cuts and a likely stall in the recovery. The Dow Jones Industrial Average DJIA fell 265.87 points, or 2.2%, to 11,866.62, its worst one-day loss since June 1. The eight-day losing stretch was the longest since October 2008, weeks after the collapse of Lehman Bros. and by some measures, the peak of the U.S. credit crisis. On the other hand, Gold futures closed up $22.80, at a record $1,644.50 an ounce, and shot past $1,660 in electronic trading. Amazing! 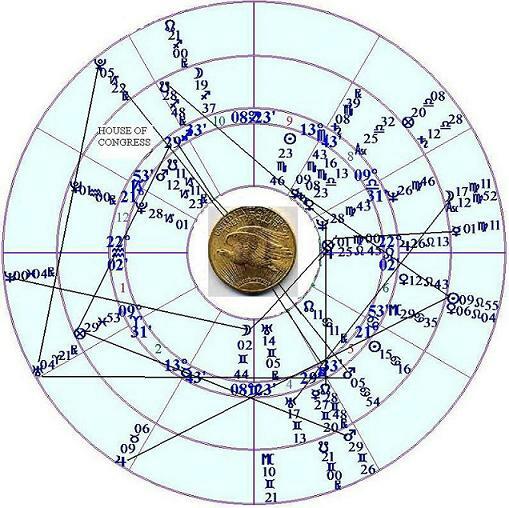 Transiting retrograde Neptune (inflation) at 00 Pisces 04 makes the last T-square in the chart. It squares the U.S. natal Moon (affecting the public) at 02 Gemini 44 (transportation) and transiting Mercury negotiations)at 01 Virgo 11which conjoins the natal U.S. part of fortune at that degree. The big picture though is that the measure will cut federal spending by at least $2.1 trillion (out natal Moon number)over a decade; and possible even more, and will not require tax increases. the U.S. debt limit would rise by at least $2.1 trillion, tiding the Treasury over through the 2012 elections. All of the pundits though, say that inflation is coming big time, as now the Obama administration and Congress have agreed to this plan to raise the debt ceiling and allow the U.S. government to continue to print and borrow more and more money. This is reflected in the price of gas also which is up again; reaching $4 in some places. And last, but not least, the following progressed U.S. chart shows that the 2nd house cusp (money) has come to 23 Scorpio 35 and is at the degree of our natal Sun. I think this shows that finally we all realize that our country, as well as a lot of the rest of us are just plain broke! I wonder too with the Sun in Leo in the 10th house, which represents the President who is a Leo, squaring transiting Jupiter accounts for his popularity slipping today in the polls. At any rate, it looks to me like both of these charts show that it is going to be a bumpy road ahead for all of us for quite awhile.